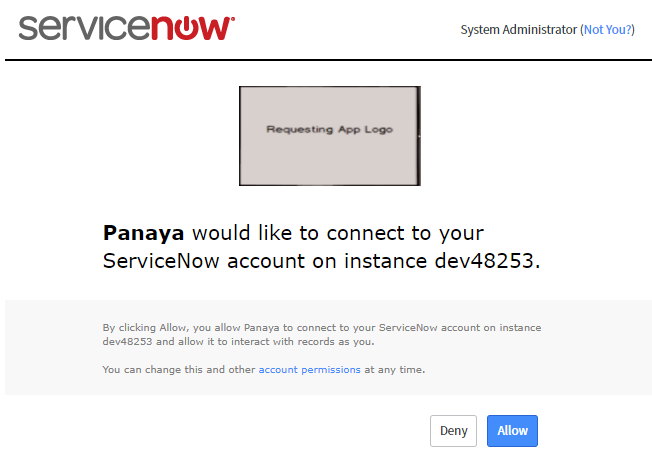 Panaya Success Center How to configure ServiceNow Integration? How to configure ServiceNow Integration? Panaya allows you to sync your ServiceNow Changes and import them as Panaya Requirements. The Requirement Risk Status will then be synced back to ServiceNow. Before you continue with this setup, please contact your Panaya Customer Success Manager or contact Panaya Support to enable ServiceNow Integration. Panaya uses OAuth to authenticate and integrate your ServiceNow Changes as Panaya Requirements. Using this method, Panaya does not store your ServiceNow Username and Password for maximum encryption security. Panaya uses OAuth to authenticate and integrate your ServiceNow Changes as Panaya Requirements. Using this method, Panaya does not store you ServiceNow Username and Password for maximum encryption security.